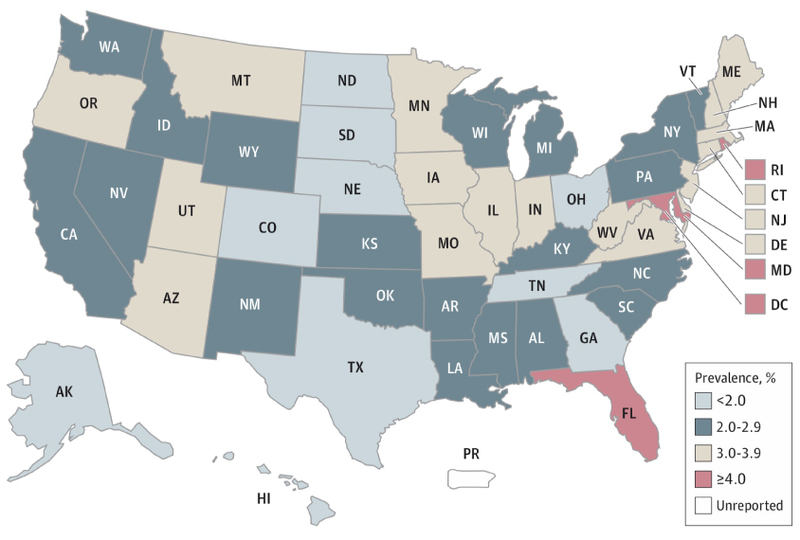 Country count: New national autism prevalence numbers vary significantly by state. About 1 in 40 children in the United States has autism, according to a survey conducted in 2016. Roughly 30 percent of those children were not being treated for the condition at the time1,2. Two independent research teams analyzed the data: One study appears today in JAMA Pediatrics, and the other came out last week in Pediatrics. Prevalence estimates from the analyses vary, but only slightly, because of differences in the statistical methods used. This prevalence is higher than the 1 in 59 estimate released earlier this year by the U.S. Centers for Disease Control and Prevention (CDC); that number was based on children in 11 U.S. states who were 8 years old in 2014. The new estimate draws from the National Survey of Children’s Health, which asks parents to respond, online or by mail, to questions about children in their household. Overall, the survey found that 2.5 percent of U.S. children who were between the ages of 3 and 17 years in 2016 have autism. Another 0.29 percent had the diagnosis at some time in their lives. These numbers are nearly identical to those from the 2016 National Health Interview Survey, which was published earlier this year. However, both surveys rely on parental reports, which may deliver higher estimates than other methods, experts say, because they do not confirm autism diagnoses. For the CDC analysis, experts reviewed children’s medical and special-education records. The new survey is the first national estimate of autistic children being treated for the condition, says lead researcher Michael Kogan, director of the Office of Epidemiology and Research at the Health Resources and Services Administration. Parents of these children are nearly 11 times as likely to be frustrated with the healthcare system as those of other children, and also more likely than parents of children with related conditions, such as attention deficit hyperactivity disorder. Autistic children are also 46 percent less likely to get the mental-health treatment they need than are children with related conditions. The researchers invited parents to answer a detailed questionnaire about their children. One question asked whether a doctor or healthcare provider had ever told them their child has autism. Another asked whether the child currently has the condition. Several questions explored family demographics and children’s healthcare experiences. The team received responses from more than 43,000 families with at least one child aged 3 to 17 years. They extrapolated the data to represent the children of this age group nationally. The Pediatrics study found that autism is 3.46 times more prevalent in boys than in girls. This ratio, which is lower than previous estimates of about 4.5-to-1, suggests that the survey picked up more girls with autism, says Young Shin Kim, associate professor of psychiatry at the University of California, San Francisco, who was not involved in the study. “There are a lot of girls who are missed in autism work,” she says. The prevalence varies significantly with location, the JAMA Pediatrics analysis found: 4.88 percent of children in Florida have the condition, compared with 1.54 percent in Texas, for example. But the exact numbers should be viewed with caution, as some states had fewer participants, says lead researcher Wei Bao, assistant professor of epidemiology at the University of Iowa in Iowa City. Still, the data underscore known geographical disparities in healthcare services and autism awareness, says Sarabeth Broder-Fingert, assistant professor of pediatrics at Boston University, who was not involved in the studies. In 2016, roughly 43 percent of children with autism had received behavioral therapy over the previous year, 7 percent were on medication and an additional 20 percent received a combination of the two. Nearly one-third of the autistic children were not receiving any treatment.